One of the biggest purchases you’ll make when you have a child is a pushchair. There is so much choice and so many styles that shopping for the best pushchair can become overwhelming. Don’t worry, take a deep breath and have a look at all the pushchairs we recommend. We have handily grouped them into different needs (like ‘best lightweight pushchair’ or ‘best parent facing pushchair’) depending on your key requirements. All the pushchairs can be bought straight away and are the most up to date models for 2019. Here are all the sections so you can jump directly to the pushchairs you are most interested in. A pushchair that can be used right from birth is a handy option if you are often popping off to shops and want a pushchair to stay in the car instead of a full travel system. To make them suitable from birth the pushchair should have a full flat recline to give your baby the best support. Try to look for a buggy with extras that will aid comfort such as footmuffs, bumpers and a raincover. If you can find one that will last until they are at least three then you shouldn’t need to buy another one either! The Cosatto Supa Stroller is the modern day stroller that lots of parents dream of having. This baby buggy offers comfort not only for the baby but also for the parent. What makes this the modern day baby pushchair stand out is its pockets meant for gadgets. It even includes a pocket for a speaker in order to play some lullabies to your baby while you are taking them for a stroll. The Supa Stroller comes in a number of different styles ranging from bold and vibrant to chic and understated so you’re sure to find one that suits your family. The stroller is suitable from birth with 4 different recline settings, up to 25 kg so should take your child all the way through until they are walking everywhere. The Cosatto Supa Stroller makes the ideal baby stroller thanks to its standout Great British Design. Included in its design are a cup holder, reversible footmuff with hand warmers, head hugger and chest pads. This makes it comfortable for both the parent and the child, especially during the winter when you want your child to be warm and cosy. It also has a UV Factor 50+ hood that protects your child from the harmful rays of the sun. And to top it all off, it even has a 4-year guarantee from this highly respected company. The Supa Stroller has a spacious storage basket for all the essentials and comes with the all-important raincover when the weather turns. It also features an adjustable handle that allows users to position them to the most comfortable height. It is free-standing once you fold the stroller making it so easy to store. And lastly, it offers an easy to clean feature with its removable seat, great when your child spills drinks or snacks! The reality is that getting a pushchair for your newborn shouldn’t be too complicated. Perhaps, you are a parent looking for a newborn stroller that is comfortable and durable at the same time? The Maclaren Quest Pushchair is the perfect option for this. Made by well-respected baby and child brand Maclaren, this newborn buggy offers a cosy and safe ride for your child. Making use of plush suspensions and even a Newborn Safety System that is not present in other products on the market. It also includes materials that will last for years. The wheels and the handle grips, for instance, are made of high-quality material that can last for a long time and can be easily replaced. Next, in terms of hygiene, the Maclaren Quest Pushchair makes a great option. It is really easy to clean off crumbs and spills- just remove the seat covers and have it machine washed. Another great feature of the Quest Pushchair is its weight. It weighs around 5.6 kg and could support a child weighing up to 25 kg (so your child will never be too big for it). The buggy folds away compactly and can be placed in a cover for easy storage. The Maclaren Quest has a multi-position padded seat that can fully recline and even an extendable leg rest to adjust to your growing child’s height. And lastly, the child is also protected from the elements when using this stroller. It makes use of a UPF +50 hood together with an integrated sun visor as well as being provided with a rain cover that also boasts wind resistance. The 5 point harness on the Maclaren buggies can sometimes take a bit of getting used to when opening and closing as there is a bit of a knack to it. However, if you end up with a toddler that is a bit of an escape artist then these straps could definitely be a bonus! Basic weight of 5.7kg; Suitable for newborns and children up to 25kg. Designed in the UK, the iSafe Racer Pushchair is a top candidate for the best newborn stroller. It has a number of clever features that can help parents with newborns. This newborn buggy offers a lightweight chassis and a spacious storage basket for shopping or a changing bag. It is also made of high-quality materials that can guarantee use for a good number of years. The iSafe Racer Pushchair can be considered a gem because of the comfort that it provides to your child. It is the type of newborn buggy that has comfortable seats that can recline in 4 positions. The pushchair also comes with a rain cover in case it ends up raining. A lot of strollers are quite complicated to use. For the makers of iSafe Racer Pushchair, they’ve designed this newborn buggy with convenience in mind. It offers a one hand folding mechanism that is easy to understand even for first-time users. The compact umbrella fold has an auto-lock feature. Making the buggy easy to get in and out of your car. Looking for longevity, a well-built design and a lightweight frame for easy manoeuvrability? Go for the Maclaren Quest. If you want a bit more style, more comfort options and some technology boosting add-ons then go for the Cosatto Supa Stroller. And if your budget is a bit tighter but you still want a good combination of comfort and ease of use then pick the iSafe Racer Pushchair. If you’re likely to be doing a lot of off-road walking with your little one, or if you want a more manoeuvrable buggy for bumping up and down city streets then an all-terrain or a 3 wheel stroller is a good option for you. They are also likely to be made of lightweight materials and can be a great option if you want to go running with your baby in the buggy. The first stroller in this category is the Baby Jogger City Mini GT Stroller. This stroller may be called mini, but it can still get over anything thrown in its way. At 112 x 62 x 110.5 cm it is anything but small and it weighs 12 kg. It still folds up nicely which makes travelling with it easy. The folding is also really simple. All you do is use one hand to lift a strap and it automatically locks into place. This makes it easy to fold or set up the stroller when you’re holding your baby. This stroller is comfortable for your baby on top of being easy to use. It has plenty of padding and the five-point harness is durable and meets all the safety requirements. Also to keep baby safe it has a hood to keep the sun off your child which is SPF 50 rated. The hood has two viewing windows, so you can make sure your child is safe and check if they’re napping. The seat is fully reclining (so can be used from birth) making it easy to adjust to the best position to make your child comfortable. It also comes with a custom fitted rain cover to make sure that your child is going to stay dry in all weathers. Other top features for the parent, is the adjustable handle height which makes it comfortable to push. The wheels are also high quality with plenty of treads and suspension to get over any obstacles and the single front pivoting wheel makes it easy to steer. One really cool feature is it has a built-in hand operated break meaning you don’t have to bend down to lock and unlock the wheels. Instead, you just have to squeeze the break. The storage is also large and spacious so you can take along all the things for a day out without needing to carry extra bags. The Quinny Buzz Xtra Pushchair is a great all in one pushchair. Its dimensions are 99.5 x 64 x 96 cm and it weighs 14 kg. This is small enough that you can take it all over. It folds down compactly and can fit into pretty much any vehicle. The folding mechanism is easy to operate and is convenient. This stroller is great to use from birth all the way to about 3 years or 15 kg. The seat is hardwearing and padded and has multiple reclining positions as well as a newborn insert to give your baby extra comfort and support when they’re little. One really cool thing about this all-terrain stroller is that it can be front facing or rear facing. This means when your child is little you can have them face you so you can bond with them while out and about. The handle height is adjustable to make it comfortable for you and anyone else using the buggy. The large rear wheels on this all-terrain buggy makes it easy to get over any obstacle and the single pivoting front wheel makes it easy to steer. The canopy keeps the elements off the child and with seperately purchased adaptors this pushchair can become a whole travel system. The basket on the bottom has a lot of room for storage and the five-point harness meets all the safety standards. You can purchase the Quinny Buzz Stroller in a number of different colours depending on your style. The Out ‘N’ About Nipper Single is lighter than the Quinny and the Baby Jogger weighing only 10 kg, it measures 116 x 61.5 x 97 cm. Don’t let the light weight fool you though. The three wheels on this all-terrain stroller can conquer any challenges thrown at it. They have top quality treads and the back suspension is strong to make the ride comfortable for your baby even on bumpy surfaces. The wheels are easily removable for cleaning or repair which is really handy after a day enjoying muddy trails. The lone front wheel pivots smoothly making it easy to navigate. The handle height is adjustable to make it comfortable for anyone to use and the folding mechanism is easy to operate. It folds up compactly and quickly so you can be on the go in a hurry. For your baby the ride is comfortable with plenty of seat padding. This pushchair offers multiple reclining positions and this makes it great for children from birth. It can also hold enough weight that most kids can ride in this stroller until around four years of age. The five-point harness meets all the safety standards, and this model even includes a removable bumper bar. The sun canopy is retractable and has viewing windows so you and baby can see each other. Another dependable option when looking for a 3 wheel stroller is the Hauck Viper Jogger. This company has been around the industry since 1921 and know a good few things about making comfortable, useable pushchairs that are good value. The Viper Jogger comes in a number of smart colours so you can pick one to suit your style. The extra-large wheels are perfect for all-terrain walks or jogs so you can navigate both bumpy city streets and muddy country walks with ease. A multi recline position seat will hold your baby from birth and the adjustable footrest makes the seat even more flexible for your growing child. A bumper bar and 5 point padded harness keeps your little one safe and comfortable. The extendable hood has a viewing panel and side vents so you can keep an eye on your abby when they are sleeping. The actual weight of the stroller is 10 kg while the maximum weight recommendation for the Hauck Viper Jogger is 15 kg. In fact, many parents consider this as a great investment considering the high-quality materials used on the Hauck Viper Jogger. The Red Kite Baby Push Me Metro stroller is the cheapest of the ones in this section and doesn’t have as many of the extras and options that the more expensive pushchairs have. However, it is a good budget option for walks in the countryside as well as bumpy city roads. With its well-researched and modern design, The Red Kite Baby Push Me stroller meets both the ergonomic and the safety requirements of many parents. It even has a shopping basket that can help assist parents whenever they have to do errands with their baby. The Red Kite Baby Push Me Stroller is suitable from birth up to a maximum weight of 15 kg (around 3 years). It has lockable swivel wheels that make manoeuvering easy as long as the stroller is carrying the ideal weight. For parents that are dealing with limited space, this is the perfect 3 wheel pushchair for you. It has a one-handed folding mechanism making the jogger easy to store when it is not in use. It can also be carried in your car without a problem. For those who want to guarantee the comfort of their child, the Red Kite Baby Push offers a lot of features that cater to this need. It has a seat that can be reclined flat, perfect to allow your child to relax and sleep. It also has an extendable hood to provide extra shade during a sunny day. The included raincover gives extra protection in case the weather changes when you’re out. With a few choices to go for when you’re buying an all-terrain pushchair, make sure you take a good look at all the options to get the one that suits your family. 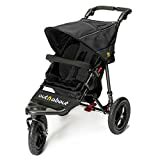 If you really want to do a lot of off-road walks and runs then you will need one at the higher end of the budget as they have the best shock suspension to keep your baby comfortable as well as the best manoeuvrability. If you’re after one that can cope with more gentle terrain but still has a lightweight chassis and good cornering then the Hauck Viper or Red Kite Metro will fit the bill. An umbrella stroller is a great option for a second pushchair to go in the car or store at grandparents. Being a cheaper option means you get fewer extras, however, there are still really good quality, design led, collapsible strollers to be had. Here are three of the best we have come across. This agile, two-tone umbrella stroller lets you carry your little angel as well as your shopping with great ease. Just strap in your little one on the fashionable stroller and then let other shoppers marvel at the beautiful colour coordination as you navigate between the aisles with great ease. Lightweight but still boasting a sturdy build, this umbrella pushchair runs on four wheels to make for a smooth and comfortable ride for your little one. An all-round suspension on all wheels absorbs the shock as you stroll over a rough surface, posing minimal disturbance to your child as they nap or enjoy a day out. Swivel/lock on the front wheels makes driving the umbrella stroller easy. The swivel mechanism lets you navigate through tricky corners without breaking a sweat. Built for comfort, the Hauck Speed Pushchair boasts a back that is adjustable up to four positions. A 5-point harness secures your toddler whenever you venture outdoors. An adjustable footrest means the buggy can grow with them. The removable bumper ensures additional safety when your child is younger. 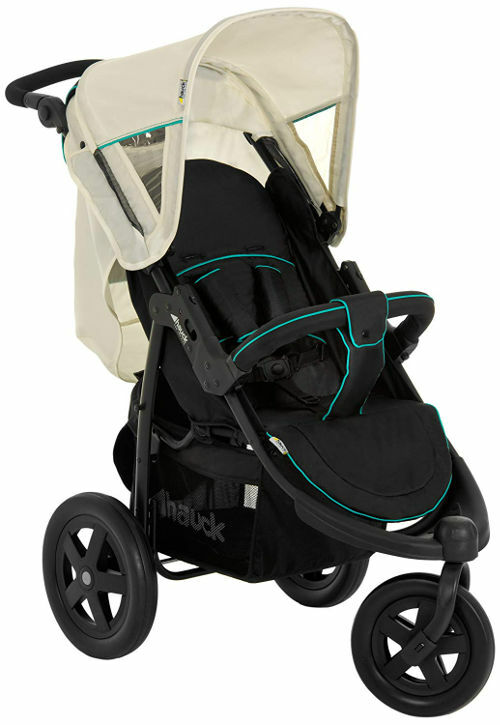 Due to the lightweight and slim frame, the fold on the Hauck Sport Buggy is really compact making it ideal as a buggy to go in the car or a travel buggy. The bumper bar is fully detachable, so when your baby doesn’t need it anymore, you can remove it and make the buggy even more compact. The umbrella pushchair weighs 7.40 kg and measures 110 x 35 x 30 cm folded and unfolds to 77 x 46 x 108 cm. 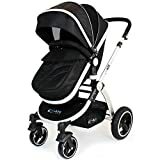 If you’re in the market for a stylish way to step out when taking your little angel for a breath of fresh air, you’ll certainly love the Zeta Citi Black Stroller. Simple, elegant and stylish, this umbrella stroller makes the perfect companion for shopping trips and travelling. The high-quality construction will serve you faithfully from birth, transforming your strolls into a safe and classy affair. A removable hood shields your precious passenger from the harsh glare of the sunlight to let them take in the sights in peace. A 5-point safety harness lets you strap your baby in the most comfortable position that keeps them safe without making them uncomfortable. The multi-reclining back lets you adjust the umbrella stroller to suit the needs of your baby to keep them cosy and comfortable as you take them out to the park. The lockable swivel front wheels make it easy to manoeuvre around narrow pathways and corners. At 106 cm off the ground, the handle on the collapsible stroller is at just the right height to let you push your baby with great ease and comfort. The fold and unfold mechanism is smooth and easy to manage and the buggy comes with a clip to keep it folded when collapsed. The collapsible stroller weighs 7 kg and measures 103 x 26 x 20 cm when folded. You can use the Red Kite Baby Push Me 2U from 6 months making it a perfect second pushchair to go in the car or on trips aboard. The seat has a nice deep angle so should accommodate your child comfortably until they are a bit older and instead want to walk everywhere. An attached shopping basket on the umbrella stroller eliminates the dilemma of taking your little one on the trip to the store. Just stash your shopping in the basket and wheel your wee one home with great ease. Paddled handles on this umbrella pushchair make for an easy grip to keep your hands soft and comfortable as you let your little angel enjoy the trip. The removable canopy ensures that your child is protected from the sun on a warm day and the included raincover gives good coverage from wind and rain. 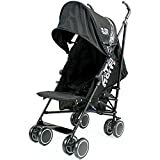 The swivel front wheels let you steer the collapsible stroller easily while the locks ensure it stays put whenever you need to stop and take a breather or enjoy the moment. When folded the Push Me 2U is really flat so can easily fit in the smallest of car boots. The umbrella stroller weighs 7 kg and measures 110 x 26 x 25 cm. Choosing the best umbrella stroller for your little one is a major decision. After all, you want one that keeps them safe and comfortable whenever you venture outdoors. If you’re looking for a lightweight yet sturdy buggy, all three umbrellas stroller fit the bill. 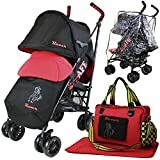 From the super adjustable Hauck Speed Plus Four Wheel Pushchair to newborn friendly Zeta Citi Black Stroller Buggy Pushchair, to the Red Kite Baby Push Me 2U that caters to babies over six months old, you are spoiled for choice. When you travel a lot as a family with young children you need equipment that is lightweight and compact. However, you still want a pushchair that is easy to use and comfortable for your child. We’ve taken a look at some of the best travel pushchairs available to make your decision easier. The GB Gold Pockit Buggy is an extremely compact stroller. It measures 42.3 x 18.5 x 35.5 cm and weighs in at only 4.3 kg. This small size and weight is one of the smallest and lightest you will find on the market. Being so small this lightweight stroller is great for travel. However, it also has the build quality of a daily use pushchair. To get an idea of how small this stroller folds, it will fit into a train or plane overhead compartment. That tells you how convenient this stroller is to use on trips abroad. This travel pushchair stands on its own when folded so you can easily transport it through an airport when collapsed. It has a small hood to keep the sun off of your child and keep them protected. The wheels are durable and the chassis is made of lightweight, but strong and durable material. One nice feature about this light stroller is it still has a storage area under the seat for a nappy bag or some shopping. The five point harness meets all current safety standards and it is lightly padded to make the ride comfortable for your child. The Besrey Stroller is another pushchair that has been designed with travel in mind. It’s defining feature is a really compact fold which also includes a pull handle so you can pull the folded buggy behind you like a wheely trolley. The lightweight pushchair weighs 6.5 kg and can be fitted easily into an overhead locker on a train or plane. Along with its truly compact design, the pushchair is also full of details that make it comfortable for your baby. The well-padded seat has a number of recline positions to help your baby sleep and an adjustable footrest to support your child’s legs. The hood provides good protection from the elements and has a viewing window so you can see how well they are napping. A rain cover is also included so you can keep your little dry. The front wheels are swivel or locking depending on the surface you’re crossing and the easy to use foot brake keeps the buggy in one place when you stop. A storage basket makes it easier to carry shopping or a changing bag. Free to Go Handle: This Baby Buggy Can be fold into a very small size for comfortable traveling. One hand folding design is highlighted and smooth when use for pack up and go. The California Baby Buggy is a great option if you like a travel stroller that is easy to collapse. In fact, it is well-designed using modern technology to enhance the comfort of your baby which makes it a great choice for a lot of parents. It also has the necessary rain cover in order to protect your child from a bit of rain or from the wind. And to top it all off, you can guarantee that the materials are all hardwearing. 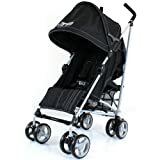 As for the features, this travel buggy has a 5-point safety harness that can keep your child safe whenever you are taking him or her for a walk. It also includes a shopping basket that is perfect for keeping all the bits and bobs that your child might need along with any purchases. This way, you don’t have to worry about carrying a separate bag. What makes it stand out is the 3 position sun hood so you can always shade your little one from glare, a great addition if you’re on holiday in sunnier climes. The California Baby Buggy has a seat that is adjustable. The wheels are well designed so the travel buggy can be used on different surfaces, even grass. And as for the maximum weight that this travel buggy can carry, you can load approximately 15 kg in it, perfect even for a three-year-old. The Red Kite Baby Push Me Lite Summer Stripe Pushchair is a simple yet user-friendly travel buggy option. This travel pushchair is perfect for kids at least six months old. This is a very straightforward travel pushchair- it doesn’t recline and doesn’t offer much in the way of padding in the seat. However, it is perfect if you have a child who still sometimes wants to sit in a buggy but most of the time wants to walk. As the buggy is so light (4.1 kg), you can easily carry or push this around when your child is walking. It folds really flat to go in the back of the car so is perfect as a second buggy on long day trips. When you’re travelling with a family you need a great compact, lightweight pushchair. Both the GB Pockit and the Besrey Stroller are designed to fold really small and be easy to manoeuvre through airports. However, if you just need a really light, basic buggy for trips with more active children then the Red Kite Push Me Lite is the cheapest and most durable option to buy. Having your child face you is good because you can make sure they are happy as you are pushing them, it helps your child feel reassured, and it gives you valuable bonding time when you’re running errands. Especially as a baby, that extra bonding time is lovely and if you walk a lot with your little one then a parent facing buggy is ideal. Some buggies can be both parent and outward facing so you can change the position when they get older and want a view of the world. The Graco Evo Stroller is a versatile front and back facing pushchair. It measures 86 x 60 x 102 cm and weights 12 kg. This makes it about standard size and a good all round stroller. One reason why this pushchair is so versatile is it has a fully reversible seat. While it can be used in a parent facing position, it can also be used in a forward facing position. This means that as your child ages and wants to look out on their surroundings, you can keep using the same stroller. This pushchair is perfect from birth until your child is around 3 years of age depending on their weight. The Graco Evo Stroller folds easily with one hand and locks into position. This makes set up easy as well. The front wheels lock and swivel making navigation around town easy. The hood covers your baby from the sun and this unit also comes with a rain cover. There is plenty of padding to make the ride comfortable for your child and the harness is strong and durable. One great thing about the seat covers is that they are removable which makes washing easy. There is also a large storage basket which makes this stroller perfect for any shopping trip especially at a place like the shopping centre. From birth to approx. 3 years (0-15 kg). The iSafe 2 in 1 Baby Pram System is the next parent facing pushchair that we will take a look at. It weighs 12 kg and measures 88 x 61 x 105 cm. Like the Graco, it can be used in either front or rear facing positions making it useful even as your child grows. It is easy to switch and can even be converted into a carrycot so a perfect investment right from birth. The frame folds up nice and compact- with just a touch of a button it folds easily with one hand, so if you are holding your baby you can still unfold or fold this stroller to use it. The handle height is adjustable so should be comfortable to use by anyone. The wheels have solid suspension that makes the ride smooth and the front wheels pivot making steering easy. The rear wheels are also larger than the front making it good for all terrain exploring. For your child’s comfort, there is a lot of padding and the five point harness meets all the safety standards. The hood keeps the elements off your child and this stroller even has a footmuff included to keep your child well protected and warm. The basket underneath is large and one nice feature about this parent facing stroller is that the basket has a zipper so you don’t have to worry about things bouncing out or getting wet or muddy. 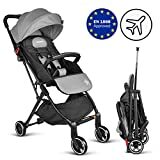 You can even get a car seat to use with this stroller as well to make a complete 3 in 1 travel system. Last up in this section is the Quinny Zapp Xtra2 Stroller. The pushchair measures 80 x 61 x 96 cm and weights in at a light 9 kg. The light weight makes this stroller great for travelling. It can be used from 6 months until your child is 15 kg and with special attachments can be used from birth. You can also buy attachments to use this with their car seat making it a full travel system. The Quinny Zapp Xtra2 Stroller has two parent-facing recline positions and three front facing recline positions for your child. There is a lot of padding to make the ride comfortable for them. The harness is strong and will keep them safe. This unit also folds up compactly and easily. For the parents, it is easy to use and the fact that it has three wheels instead of four makes it easier to navigate tight areas. The single front wheel pivots smoothly and the wheels are great on all terrain. The canopy is large and will protect your child from the sun. The storage basket on this particular model is a bit smaller than the others though, but still has enough room to hold a few essentials. The handles are comfortable to grip and in a good position for long periods of pushing your child. When your baby is little you want a parent facing pushchair so you can continue to bond while you are out and about. All three of these models fit the bill with easy to switch seat positions and great extra features. For complete functionality, the iSafe 2 in 1 pram system also gives you all-terrain wheels, carry cot layout and an adjustable handle to be the best of a very good bunch. Finding the best cheap pushchair can be hard as sometimes cheap means that they lack quality. But the pushchairs that you will read about here will have all the features you need while still being in your price range. These cheap strollers will be comfortable for your child and rugged enough that you can go anywhere with them. 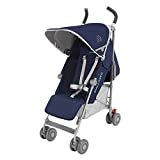 Also, these are the best cheap pushchairs for 2019, so you know that you are getting a model that is up to date with all the current features. Read on to learn about all the features that are packed into even these cheap buggies. The Zeta Vooom Stroller is a small compact stroller. It measures at 75 x 48 x 110cm. This means that it can fit into most vehicles boots without any issues. It also only weighs 9 kg making it a perfect pushchair for any time. It has an ergonomic handle that also functions as a carry handle making it even easier to transport. When it gets to the time of actually using this stroller it is easy too. The locking mechanism is easy to operate and you can unfold this Zeta Vooom Stroller with one hand which is very convenient. This stroller can also be used from birth thanks to the four position flat reclining seat and also the adjustable footrest. The harness that this buggy is equipped with meets all current safety standards. The pushchair a five-point harness with an easy to use button that parents can press to unhook the child, but the child can’t release themselves. The Zeta Vooom Stroller has a large shopping basket in the bottom making it easy to carry around your nappy bag or whatever else you need to carry. There is also a large pocket in the top of the hood. The hood is large and will keep the sun off your baby and it has a window built into it so you can see your child to make sure they are safe or check if they’ve dropped off to sleep. The wheels are rugged and they are lockable so you don’t have to worry about the stroller rolling away. Lastly, this pushchair has a lot of padding to make the ride comfortable for your child. To help it be even more comfortable for them it comes with a rain cover to keep them dry and protect them on windy days. The Zeta Vooom comes in loads of different colours and with or without accessories so take a look at all the listings to make sure you choose the one that suits you the best. The Zeta Citi Stroller is probably the baby buggy that can provide the best bang for your buck. It offers a simple and stylish design together with its durable and lightweight construction. This is the perfect baby stroller for families that prioritise ergonomics and safety. It comes with a multi-reclining backrest and lockable swivel front wheels. This makes it easy to navigate the baby pushchair smoothly in different directions. The Zeta Citi Stroller has a removable hood that can protect your child from the sun and even from a bit of rain. Its lightweight umbrella style makes it the perfect option for mums and dads that want only the best comfort for their child when they are taking a stroll outside and can easily pack it away in the boot. This baby stroller also makes use of a five-point safety harness to secure your baby. The Zeta City Stroller is something that is built to last. It is also suitable for babies from birth. 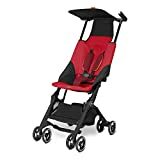 The Red Kite Baby Push Me Lite Pushchair also features in our ‘Travel Pushchairs’ section but it needs another mention as it really is a great cheap pushchair! 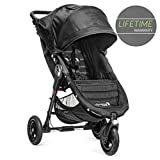 While it doesn’t have all the features as the other strollers on this list, it still gets the job done very well and at a price anyone can afford. This stroller is the most compact of them all at 59 x 36 x 97 cm. It also only weighs 5 kg. This small size makes this a wonderful stroller to just keep with you in case you need it. Also, the fact that it is so cheap means that this is a good option to keep at the grandparents in case you forget your main stroller. This pushchair can be used with any child who is over 6 months. The seat is padded well, but it doesn’t have any reclining positions. Don’t let this discourage you though. The stroller still has a top rated five-point safety harness to keep your child safe. This model lacks storage like the other models, but it has very comfortable handles that are padded. This stroller also still gets around really well. The wheels roll smoothly and have locking mechanisms built into them. The front wheels also swivel making navigation easy. While this stroller doesn’t have all the bells and whistles of other pushchairs it makes up for in doing the job it is meant to do well. It is durable and will last. Also, you can get replacement parts for this model if anything goes wrong with it. This stroller is great for a backup or if you are on a really tight budget. Finding the best cheap pushchair can be tough with all the options on the market, but one of these on this list will be sure to meet your needs. Whether you want an affordable pushchair such as the Red Kite for a back-up or a more advanced one such as the Zeta Vooom for daily use. Maybe you want a stroller in the middle like the Zeta Citi that is cheap, but stylish. No matter your budget or needs one of these cheap strollers will be just the thing. If you have a little girl sometimes only a pink buggy will do. Even with the feminine style, you still want reliability, safety and durability from your pushchair. Take a look at these two great options that we’ve found- the best pink buggies in our opinion! Celebrity mum Billie Faiers out does herself to let you step out in style when taking your little princess out to the shopping centre or the park. Sturdy and lightweight, the My Babiie MB100 Billie Faiers Pink Stripes Pushchair makes a great everyday buggy. An efficient wheel system makes for smooth and seamless movement that requires minimal effort as you wheel your baby around. You can push the cute little buggy one handed without breaking a sweat. The lovely pink buggy comes with a large basket to house a padded seat cushion to keep your baby cosy and comfortable as you take a lazy stroll to enjoy some fresh air and sunshine. With a slight adjustment, the padded seat lays completely flat to accommodate a newly born baby with great ease. The combination of rear and front wheel suspensions and adequate padding on the seat absorb any shock and vibrations to keep your baby safe and comfortable. The lockable swivel front wheels make wheeling your daughter through the park and narrow paths an absolute breeze. The pink pushchair boasts a compact fold, taking up little space in the car when you need to travel. A quick release mechanism lets you set it up and take it down in seconds when you need to use or stow it away. A large extendable hood keeps your little princess safe and protected from the elements including the sun, wind and even rain should you be caught off-guard while out and about. 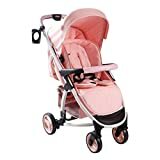 High quality and boasting an amazing range of luxury features; the Sail Stroller defines class and style in all matters pink stroller. 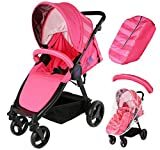 The super lightweight buggy comes in a delightful shade of pink on a black frame to attest to your fashion forwardness. A superior suspension system on the wheels lets you glide over rough patches without upsetting or disturbing your child. A large extendable hood keeps your little one safe from the elements while shielding her from prying eyes while she naps. The expandable side panels keep the harsh glare of the sun off her and shield her from gusty winds while eliminating the need for additional shades and parasols. A media viewing tablet pocket lets you take her favourite cartoons and movies with you wherever you go. The multi-position, flat reclining seats provide you with a great range of options while eliminating the need to make additional purchases for the newborn stage. This pink buggy will serve you from birth until your little angel weighs in at 15 kgs. At 35 cm, the super wide seat with a 5-point safety harness makes each stroll an enjoyable experience for your little one. The swift one-hand-fold away and auto-lock fold away mechanism makes it easy to fold and set up the pink stroller with the greatest of ease. The shopping basket is really large and can easily hold a changing bag and shopping freeing up your arms. The adjustable handle lets you set the height to suit your specific needs. This pink buggy weighs 6 kg. Choosing the best pink buggy for your little one is an important decision. After all, you want it to serve you for a long time while also making a fashion statement. If you need compact, lightweight yet sturdy pink strollers, both of these fit the bill. Make your decision based on whether you prefer the subtler pink of the Billie Faiers model, or the stand out pink of the Sail Stroller. So there you have it: a buggy or pushchair for every family catering to every need. Hopefully, you’ve managed to find the perfect one to purchase and if you have please let us know in the comments how you’ve got on with it.